over a year ago when I first read the book and found myself lacking words. It was actually not the type of book that I ever would have picked up myself, except that the ladies at Blue Elephant Bookshop (R.I.P. I still miss that store! *sniff*) insisted that it was amazing book that I could not miss. I was flying standby to Seattle to spend the weekend with a friend when I started it. I knew I would have plenty of time sitting in airports to enjoy it. It was in the Cincinnati Airport that I totally lost it. I was trying to eat my lunch and couldn’t stop laughing and crying. I wish that this was my only story where I am the crazy person crying in public over a book, but it happens pretty regularly. I finished it on the plane just before reaching Seattle and from that moment have insisted that everyone read it. 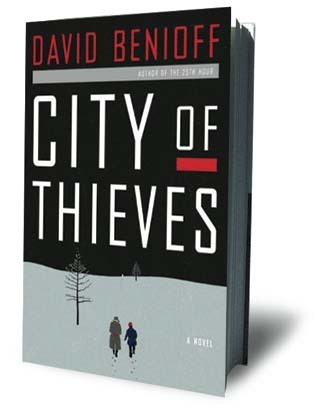 It is a good candidate for the Books We Force on Our Friends series we do here on the blog, so when I had the opportunity to force it on my book club (even though it is not YA), I totally did. For me this book was an amazing coming of age story, that somehow managed to balance humor with darkness (and in some cases, just pure evil). We had one of our best discussions thus far, I think, so I am looking forward to what the rest of you think about it. RS: I will absolutely agree that this book generated one of our best discussions to date in YA for Wine Lovers. I adored the book, but at the same time had a very hard time reading it. The subject matter was so dark that I literally had to put it down for several days on two different occasions. I went into the story totally unprepared, which I think may have been to my benefit. The things that the characters went through in this book shocked me and broke my heart, and yet there was still a sense of hope throughout their journey. It’s a story that I think will stay with me for a long time. I highly recommend it. Shake the egg white on its own until is it foamy. Add all of the wet ingredients and shake. Once everything is mixed, add ice to chill and shake some more. The $20,000 Pyramid. You’ll want to make yourself one of these. Delish. Welcome to our first virtual installment of our monthly book club, YA for Wine Lovers. We had a fabulous meeting of the book club this past Monday here in Atlanta and we cannot wait to continue the discussion online with all of our readers! 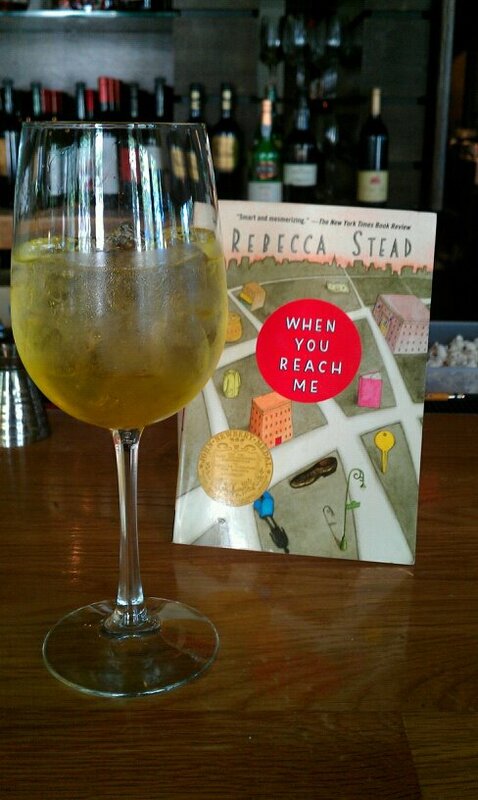 This month, we read When You Reach Me by by Rebecca Stead. It got some mixed reviews from the Monday crowd, so we’d love to hear what you think. So without further ado, grab your book and your cocktail and let’s get started! RS: Okay, I know there were some people who weren’t thrilled with this month’s book, but I personally loved it! I thought it was a fantastic mix of a coming of age story with something a little more fantasy. I am always interested in how a story is constructed when it is told from one character’s point of view, and so I really dug the way that different characters weaved in and out of the story as they became more or less important in Miranda’s world. One point that was brought up in our meeting on Monday was how so many of the characters weren’t fleshed out, but that to me felt authentic. I think we’ve all at one point lost touch with someone and then had them come back into our lives and feel like someone both familiar and entirely new. That’s how this felt to me when Miranda began speaking with Sal again at the end of the book. We as the audience didn’t know much about him because Miranda herself didn’t know much about him. She knew the Sal that she had grown up with, but not the boy standing before her who had gone out on his own, made friends, and had to face his fears alone. She was seeing him with new eyes just as we were. I loved the tie-in with our book club book from last month, A Wrinkle in Time. I thought at first that the call-back to that book was what made the time travel seem plausible in this one, but I think it was actually the way that Stead introduced it through Marcus. Here was a character who, even at a very young age, had a grasp on things that most of us will never understand. I loved the interactions between Marcus and Miranda, and how he helped her see something she thought she knew so well, her trusted favorite book, in a whole different way. Another thing that made the time travel story seem more plausible was that it was never presented as an easy solution. Older Marcus clearly struggled to come back through time, and even when he made it, it was obvious that the experience had taken its toll on him, both physically and mentally, but he knew that had he not saved Sal, both would have lost the lives they were meant to lead that day – Sal from the bus, and himself into a spiral of guilt from having caused the accident. Even though this is somewhat a fantasy story, it is grounded in reality and the relationships between the characters. I though Stead did an excellent job of capturing that delicate age, when people are drifting out of your lives and others are drifting in. How you can think you have always hated someone only to find yourself liking them once you really get to know them, as Miranda did with Julia. I also loved the relationship between Miranda and her mother. One of the most powerful moments of the book for me was when Miranda and her mother were waiting on her friends to come visit her at her apartment and she realized that her mother knew, as she did, how poor they were in comparison with her friends. It was that subtle shift from seeing her mom through a child’s eyes to a more adult view that really struck a chord with me, and it was moments like that throughout the book kept me incredibly invested in Miranda’s journey. SM: I don’t even know where to pick up from here! Robin Sparkles and I clearly had a very similar reading experience. I first read this book a few months ago and tried to write a post on it, but nothing made sense. My mind was blown and I had no words. I felt surprised at every turn with this book and by the time I realized who the Laughing Man was and what was really going on, I was in shock. I knew nothing about the book prior to reading it, so the idea of time travel and the theory that we exist in multiple times and places all at one time… it wasn’t what I expected in a children’s book and I love that about it. Rhyme: I totally second that. My favorite thing about this book is that it didn’t read like a children’s book. I think that is a very delicate line to walk in children’s literature–to write something accessible and readable for children, but that doesn’t feel immature. I didn’t feel like the other characters felt flat, and if anything, when you’re a kid, everyone else is one-dimensional to you. I think that was pretty clear in Miranda’s case, where she is just waking up to how other people feel and think; that they’re not just characters in her world. SM: Those of you who have read the book, know that the theme of the $20,000 Pyramid runs throughout the book. Not just because Miranda’s mother is obsessed with it, but it begins to become a part of Miranda’s life and how she views it, along with some clever chapter titles that pull the theme together. For this reason, our wonderful fellow reader and bartender, David, named this months drink The $20,000 Pyramid. It will be a little trickier for you to make at home, as some of the ingredients are not something everyone has just laying around, but trust me when I tell you it is worth the work! For kicks, we recorded David teaching everyone how to make the $20,000 Pyramid. Clearly we are amateurs, as we noticed after the fact that he forgot to add the splash of Sprite at the end, so don’t forget that part when you make it yourselves! A few weeks ago I was hanging out with my friend David and we were talking about books and what we were reading. Suddenly a little light bulb went off in his head and he looked at me and was like, “We should totally start a book club!” I, of course, agreed that that would be a fabulous idea and moved on, not thinking that much would come of it. You see, I often have ideas like, “Let’s join a kickball league!” or, “We should really take some ballroom dancing lessons.” and even, “I heard that in Florida they have a Cowboy Resort! We should do that and learn how to lasso things while drinking whiskey!” Needless to say, I sometimes lack follow through. Lucky for me, David does not! Which brings us to about two weeks after our story started. I got a phone call from David that went something like, “So Parker’s on Ponce is letting us use one of their rooms for our book club. There will be half priced bottles of wine and I am going to make theme cocktails for every book! So what are we going to read?” And that is when I realized that we were in fact starting a book club and that I was going to be half responsible for it. We picked out books, teamed up with a local indy bookstore, Little Shop of Stories, and the rest is history, so to speak. On Monday we had our very first meeting to discuss Madeleine L’Engle’s A Wrinkle in Time. AND PEOPLE SHOWED UP! Not just people that I know and thus they felt obligated to show up so that I wasn’t just sitting at the bar by myself, but actual strangers that just wanted to drink wine and talk about books. Which is exactly what we did. David’s drink was much prettier. This is a random photo from the internet, but you can at least the the general idea! 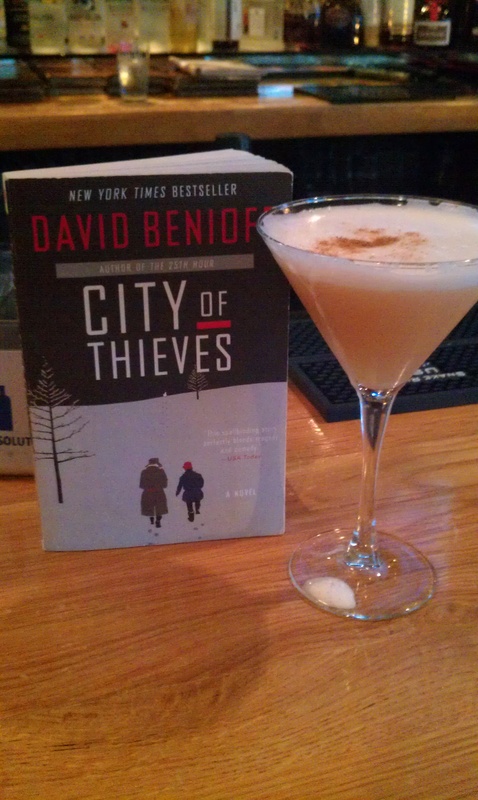 To go with our book talk, David made a delicious drink that he named The Tesseract, in honor of the book. Those of you that need a reminder, a tesseract is basically like a 5th dimension that is kind of like folding the fabric of space and time and it allows you to move great distances and times in an instant. Along with time and space travel, the novel has strong themes of the battle between light and dark, good and evil. Playing off of these concepts, The Tesseract drink is a dark blue at the bottom and clear at the top, showing a distinct difference light and dark and space. David said that it was how he pictures the 5th dimension to look. I was not thinking ahead and failed to take a photo of the beautiful (and delicious) drink, but below is the recipe! For those of you that would like to participate virtually with us, we will be reading Rebecca Stead’s When You Reach Me for September 10 in Decatur, and will be discussing it on the blog that week. We will have a new book themed drink to share with y’all and encourage you to come up with your own! 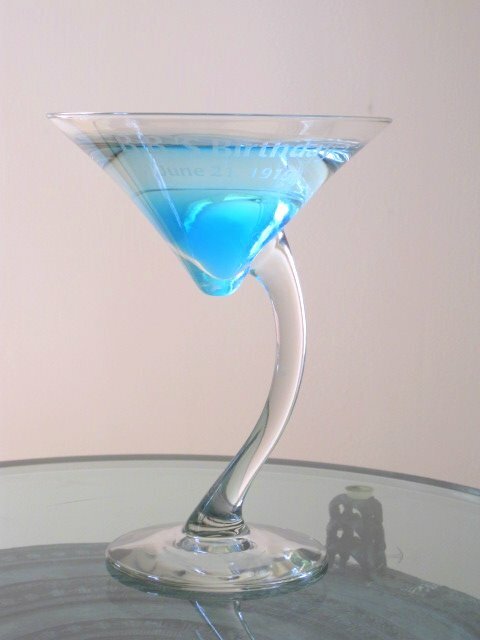 We would love to hear your thoughts on the book as well as your cocktail ideas! You can also join in the discussion at our YA for Wine Lovers Facebook Page.